Kanazawa, Japan – In 1982, researchers reported a link between chronic gastritis and stomach bacterium Helicobacter pylori, triggering a flurry of research into this newly-identified pathogen. These studies made it clear that in addition to its involvement in gastritis, H. pylori was a significant factor in the development of both peptic ulcers and gastric cancer. But while the link between the bacterium and disease was clear-cut, exactly how H. pylori caused gastric tumors remained the subject of much debate. Now, almost four decades later, researchers from Kanazawa University and the Japan Agency for Medical Research and Development have finally shown how inflammation caused by H. pylori infection causes the proliferation of gastric epithelial stem cells, leading to gastric tumors. In a report published recently in cancer genetics journal Oncogene, the researchers describe how they built on previous findings to solve the mystery. NOXO1 is a component of the NOX1 complex, which produces tissue-damaging molecules called reactive oxygen species (ROS). ROS, or more accurately, the oxidative stress caused by these molecules, can result in mutations in the DNA of stomach cells, leading to tumor formation. Inflammation caused by H. pylori infection also produces ROS, increasing oxidative stress in the stomach. In the newly-published study, the research team showed that inflammation caused excess production of NOX1-complex proteins in response to signals from NF-κB, a regulatory protein that turns on genes to combat stress or bacterial infection, and which is a major player in the inflammatory response. 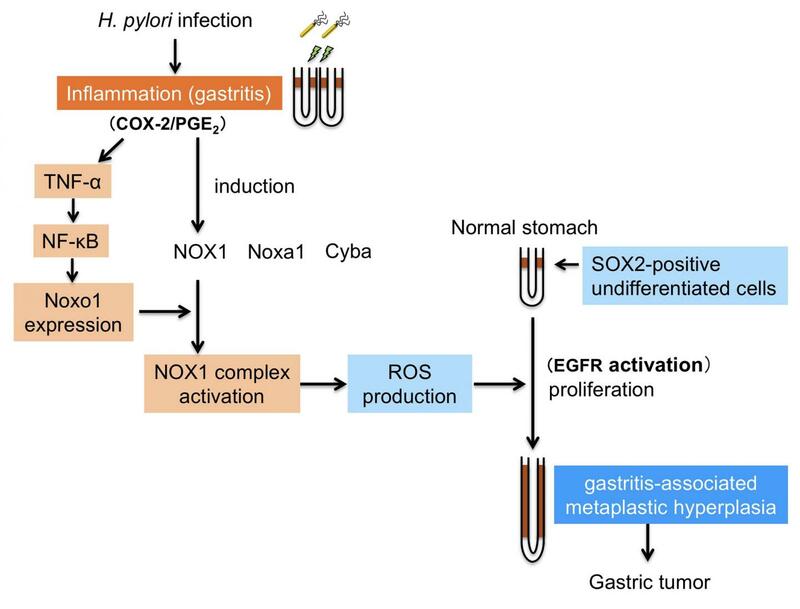 However, most importantly, they found that NOX1/ROS signaling caused gastric epithelial stem cells to multiply uncontrollably, resulting in tumor formation. Knowing this, the researchers used a drug to suppress the activity of the NOX1 complex, which immediately halted the growth of gastric cancer cells. Even more excitingly, disruption of Noxo1 in a mouse gastritis model stopped the proliferation of epithelial stem cells.